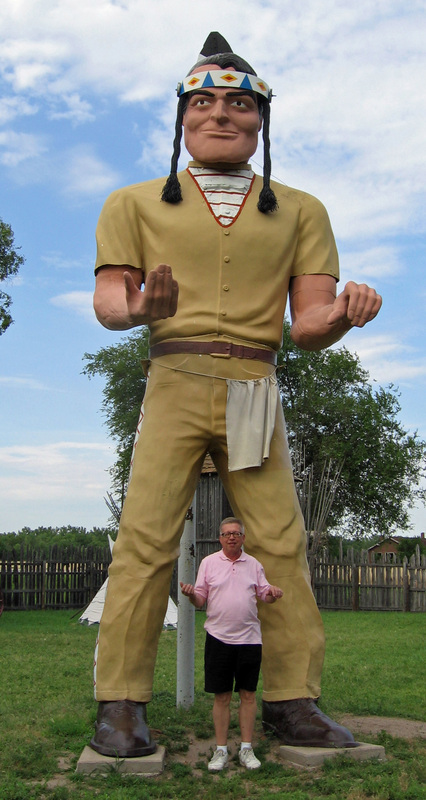 Cody Trading Post – The Home of My "Big Things"
Here’s a bit of serendipity — we stopped for the night in Fort Platte, Nebraska and before dinner stopped, for some reason, at the Fort Cody Trading Post near our motel. Surprisingly it was more than a “cheap gift shop.” In addition to the expected shot glasses, key-chains, stuffed animals, they have a Buffalo Bill Wild West Miniature Show that is fascinating. The show, made by Ernie and Virginia Palmquist, took 12 years to carve and contains over 20,000 hand carved pieces….many animated! At any rate while browsing I noted a framed Smithsonian magazine with a Native American Muffler Man featured. When I asked where this big fellow was I was told he was right out back! Thanks all at the Fort Cody Trading Post, you made my day.